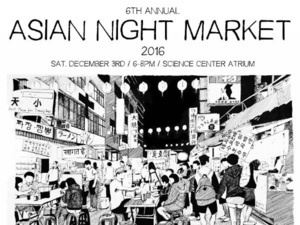 It's that time again: 6th Annual Asian Night Market! Asian Night Market was created in 2011 to host our own night market at Oberlin, similar to ones in Asia, with food and entertainment. This event is, so far, the only opportunity for collaboration between many of the student organizations that span the Asian diaspora community on campus. This year's Food for Thought, this week, will continue discussion to expand the Night Market, specifically with a PANEL highlighting our personal connections to our cultural foods. Other critical issues and food politics that we may touch on: consumption, commercialization, and fetishization of Asian food; diversity of Asian food; and using food as an ambassador for Asian culture, especially on this campus. If you attend, you can buy a discounted ticket for $3. Otherwise, tickets will be $5 at Wilder and at the door.